Description: Breeding: Reinder 452 x Beart 411 x Jurjen 303. All mares (mothers in her breeding line) are awarded with the predicates STAR and Preferent! In foal by the famous approved and multiple champion Friesian breeding stallion Jurre 495. This mare is 4 years old, extremely elegant, as black as coal, nice long mane and tail, 3 good and correct gaits with a great conformation and fantastic breeding line! She is well ridden under the saddle and also driven with a marathon carriage, also in traffic. She has a very good size for a Friesian mare, 16.1+hh / 1.66mtr. and will grow another 3 centimetre. She has a very good character and is easy to ride! Description: Anouk is a beautiful STAR predicate Friesian mare. She is 16.2 hands/1.68m, has nice long mane and tail and is 200% safe, bombproof and easy to ride by all level riders and amateur riders! She is ridden under the saddle also in traffic and she is driven with a marathon carriage in traffic as well. She had 2 foal's in her life and both won the 2nd premium award. Her mother and grand-mother are STAR mares as well. A STAR predicate mare is very special and difficult to find. A STAR mare has won all her tests. 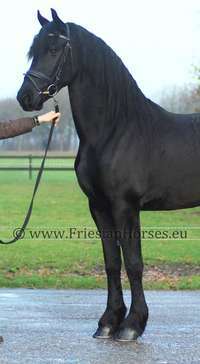 She receive from the Royal Dutch Friesian studbook the STAR predicate in 2012. Her SIRE is Onne 367, big size, multiple champion of the breeding stallions and also did excellent in sports. Her mother's SIRE is known all over the world as the most famous and most popular Friesian breeding stallion Jasper 366. Description: Exceptional beautiful Friesian STAR Sport mare. She has very long mane and tail for a mare and is 100% safe and bombproof to ride, also in traffic. This mare has a lot of experience and competed on high level dressage. She is doing; shoulder in and out, half passes to the right and left, the traversals, working pirouette and single changes. A super easy to ride horse for beginners, amateur riders and she will perform extremely well on dressage competitions and shows. Ditske is a beautiful and elegant Friesian mare and has an easy going character and very good movements. She is well bred; mother and grandmother are both STAR predicate mares! Ditske has a beautiful conformation and long mane & tail. She is very easy to ride, also in traffic, for hacking and dressage. Ditske is also a great Friesian mare for amateur riders and she experience in driving with a marathon wagon also on the roads in traffic. Ditske is a sweet family horse but also a great horse for dressage competitions! Hiske is a beautiful black Friesian mare with long mane & tail, excellent movements, easy to ride and a sweet and honest character. She is well ridden under the saddle and she is also experienced in hacking / trail riding on the roads in traffic and into the woods. It is a very friendly mare also easy going with other horses. Beautiful elegant Friesian mare, safe, bombproof and very friendly character. Not afraid of traffic or farm animals. She has excellent movements!